The morning of the 11th June greeted us with wonderful rain and fog in abundance. The air is so thick I can almost cut it with my Victorinox. I'm sure we will OD on oxygen today. 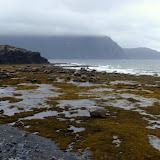 Gros Morne National Park a UNESCO World Heritage Site, is truly spectacular even in rain and fog. Let's discover more of the park. Our quest for the day is to find some live crustacean for dinner. More specifically we were looking for an arthropod called "Lester the Lobster"
With rain gear in hand, we head down to the closest little town, Rocky Harbour. We find the local seafood outlet.... what a selection. We pick up four live lobsters, smoked salmon and some fresh cod. I could have bought the whole store. By this time the the fog is so thick, I wish I had a fog horn on my truck, maybe for Christmas? We head back to camp and drop our dinner off. We have a quick lunch before heading out in a different direction, Norris Point. With the windshield wipers now in second gear, and every foghorn in the area blowing, we work our way down towards Norris Point. It is really beautiful, at least what we can see. We decide this is worth another trip when the sun is out. We head back to camp, it must be 4 pm some place.... Happy Hour! Jörg and I get the lobster pot ready while Silvia and Liz prepare a scrumptious salad. By now the smell of the garlic butter is so strong all the mosquitoes in Gros Morne National Park have left for a less hostile environment. With a bottle of Rosé, candle light, salad and lobster it can rain as much as it wants. With enough wine you can't even hear the fog horns. Life is good! The 12th of June, not a cloud in the sky (did you know, one can actually get a headache from Rosé wine). This morning looks good, and we have a busy day planned. First of, back to Norris Point. It is a spectacular vista as we approach the town of Norris Point. The town is situated in a "fjord" like setting, wow! Half way down the hill is the Norris Point Lookout with breathtaking views of the town, the inlet and the Tablelands in the background, very dramatic scenery. Get ready to launch your kayak. The town gets it name from the first white settler Neddie Norris. The town is now a wonderful place to visit and a great place to enjoy the outdoors. Kayaking anyone? Next on the agenda is Western Brook Pond. If there is only one thing you have time for when visiting Gros Morne National Park, this is the one place you have to visit. The scenic grandeur of the lake and the mountains is simply breathtaking. Western Brook Pond is a lake that was carved into the most northerly tip of the Appalachian mountains by a masive glacier. Eventually the inlet or fjord became land-locked and the salt water was replaced by fresh water. The water level is 30 meters above sea level, however 60% of the lake's water is below sea level. The lake is 16 km long and is home to several species of fish, like: salmon, brook trout and arctic char. The surrounding cliffs rise over 2000 feet. To get to Western Brook Pond you drive 27 km north of Rocky Harbour, then you hike 3 km to the lake. It is an easy and scenic hike on boardwalks and trails over bogs and through forests, just wonderful. Once you arrive at the lake you can take a boat tour, we suggest you make a reservation. The tour costs $56.00 per person and since it it in a National Park, you will of course have your annual parks pass with you, otherwise you will have to add 9.80 per person. NOTE, they only take cash. Gros Morne National Park is also home to the Tablelands. The Tablelands is not your typical Newfoundland landscape, it's like you landed on the moon. This high plateau or mountain is located on Hwy 431, between the towns of Woody Point and Trout River. Just so you can see how wast this area is, click on the map ( top of page) where "Tablelands" is marked in, and then use the satellite view, ( click icon in top right area of the map screen ). Why are the Tablelands such desert where nothing grows? It is more then likely due to the so called ultramafic rock; peridotite, that makes up the Tablelands. Peridotite is an igneous rock that comes from the earths mantle about 30 km below the earth's surface. This rock is pretty well toxic to plants. It is very high in magnesium and full of heavy metals. It is believed that this part "The Tablelands" was at one time pushed up to the surface where it is now for us to visit and study. This pushing and shoving more then likely took place several hundred million years ago. The weather was a bit on the cool side when we visited, so we decided only on a short hike and then head off for the town of Trout River. It would have been wonderful to hike to the top of the ridge, if we would have had more time. Trout River is a very picturesque old fishing village or town. The town's first settler was named George Crocker. George and his family were the only people living here for many years. Once the lobster fishery started the town grew. In 1973 when Gros Morne National Park came about, tourism became an industry in Trout River. Many job opportunities became available in the park wich was welcomed by the town's local people. We had a walk about in the little town and even saw whales from shore.... awsome! For more pictures of all these places check out our on line Picasa Web Album. Just click the picture below.